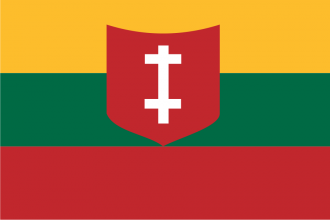 Lithuania is a minor power in Northern Europe on the coast of the Baltic Sea and is one of the three "Baltic states" in-game. Historically, it was invaded and occupied along with other Baltic States on the 14th of June, 1940. Usually left alone until mid-game, a skilled player could turn it into a moderate power in Europe, and possibly even more! Lithuania broke free from the collapsing Russian Empire in 1918, along with the other Baltic States and found itself quickly in conflict to defend its newly gained independence. Lithuania fought against the Russian SSR (precursor to the Soviet Union) along side Poland and the other Baltic States and was able to stop the Russian grand offensive of 1918-1919. After beating back the Bolsheviks. Lithuania then, along with the other Baltic States, fought an internal war against the West Russian Volunteer army (essentially a leftover remnant of the Imperial Russian Army) which had officially joined arms with Alexander Kolchak's White Russia in the Russian Civil War (Which opposed Baltic Independence). After exterminating any remaining Russian military units on its territory, Lithuania found itself at war with newly-independent Poland. The reason for the war was a territorial dispute, the Vilnius region had been assigned to Lithuania by the Russians in the peace treaty signed after the Baltic Wars of Independence but was occupied by Poland. Lithuania's attempted counter-offensive and reclamation of the region was stopped by a military commission of the League of Nations. Lithuania declared Kaunas its temporary capital and the territorial dispute between the two countries would persist throughout the years to come. As part of the secret protocol of the Molotov-Ribbentrov pact, Eastern Europe was divided into spheres of interest by the German Reich and the Soviet Union. Lithuania was initially in the German zone and was forced to cede the Memel area but was occupied by the Soviet Union in 1940. This occupation was briefly interrupted by Operation Barbarossa when Germany occupied the area, reorganizing the Baltic States into the "Reichskommisariat Ostland". The area was re-occupied by the Soviet Union in 1944-1945 and Lithuania was annexed into the Soviet Union along with the other Baltic States after the end of World War II and reorganized into the Lithuanian SSR. Lithuania remained part of the Soviet Union until 1990 when it declared itself independent during the collapse of the Soviet Union. The other two Baltic States followed suit with their own declarations. Lithuania does not have a National Spirit at the game start 1936. As a non-aligned country Lithuania has good relations with other non-aligned countries (+10). Especially with its neighbors Poland and Latvia (+20) for also sharing the same ruling party. Otherwise its a mostly isolated country, with all diplomacy values revolving around "Different Ideology" (-10), "Same Ideology" (+10) and "Same Ruling Party" (+20). They have a land border with Latvia; Poland and German Reich. They have a coast with two Naval Bases (both lvl. 1). However Memel is usually seized by Germany. Lithuania has no alliances at the start of the game. However they may join the Miedzymorze if created by Poland. Lithuania is in the Baltics, which is part of Northern Europe. It is made up of three states: Kaunas; Siauliai and Memel. They have a land border with Latvia, Poland and Germany. They are not landlocked, with a small border on the Baltic Sea. Memel is usually seized by Germany, however the border with Latvia may provide a unique expansion route. Lithuania is mostly Plains (at 56% of all provinces), with 32% Forest, a small number of Hills and one Urban. Lithuania has the generic national focus tree. The tree has branches for Army Effort, Naval Effort, Aviation Effort, Industrial Effort and Political Effort. Proper use can make Lithuania unique compared to those with a more centralized focus tree (Germany, United Kingdom, etc.). Lithuania has an event named "German Demand for Memel"; with options to decline (likely will lead to war) or to accept and cede the state. Antanas Smetona of the non-aligned Lietuviu Tautininku Sajunga (LTS) is in power with slightly less than half of the government in its control in both scenarios, holding 45.40% popularity. Unlocks Communism On The Rise decisions. Unlocks Fascism on the Rise decisions. Unlocks Move Towards Democracy decisions. *These numbers represent the available resources for production at start of the game. In the bracket are the resources exported for trading. Manpower totals 55.05K, with 27.09K Free Manpower. Lithuania starts out with 3 Infantry Divisions of 9 Infantry companies each. Lithuania is one of the most difficult minor nations to play, as it is a target of both the German Reich (who claims Memel) and the Soviet Union (who claims everything else). This makes Lithuania's position very precarious, as it cannot fight either power on its own. Since the USSR is by far the greatest threat to its survival, Lithuania must seek to ally itself with either the Axis or the Allies until it can stand on its own two feet. If Lithuania becomes Communist, the people may ask to integrate into the Soviet Union. If accepted, the Soviet Union will annex Lithuania, ending the game for the player. All the Formable Nations involving Lithuania require you to control Memel. Therefore, a strike swiftly will be needed if the player wishes to increase the country's core territory before Germany claims Memel. Remember that the Allies will only be able to help Lithuania as long as Denmark in neutral or Allied. As it will prove troublesome to spare troops from the country's own borders to aid Denmark, preparations need to be made for a multi-year defensive war until (hopefully) one or the other is defeated and the Allies would be able to send support. By far, the best path for an aggressive Lithuania (as with most other minor powers) is to go Fascist. At the start of the game, the player should blitz the Political Branch of the National Focus Tree until he reaches the "Militarism" focus. Next, he should begin work on the Industry branch. As soon as the player has enough Political Power he should get a Fascist Demagogue in order to quicken the change to Fascism. Performing Anti-Communist and Anti-Democratic Raids will help by slightly increasing stability in the long run as well as reducing the stability loss from the Non-Aligned party's weakening hold over the country. Once the ruling party becomes Fascist, the player must justify a wargoal against neighboring Latvia. In order to successfully conquer Latvia, however, it is recommended that the player have at least 5 or 6 Infantry Divisions equipped with Engineer Companies and have one or two more in training. Once a flanking maneuver is executed through western or central Latvia, the AI's tendency to rearrange its forces will likely kick in, allowing the player to occupy Latvia's three cities and force its government to capitulate. The next target ought to be Estonia. As soon as you are at war with Latvia, begin justifying a wargoal against Estonia. Estonia's limited population will prevent it from deploying more than three or four divisions (although these could potentially be 7 Infantry and 3 Artillery monster divisions). A smart player can outflank these forces with the more numerous Lithuanian divisions and force Estonia's capitulation in less than a month. At this point, if Waking the Tiger is enabled and the player still controls Memel, the player may take the decision Unite the Baltics, which grants cores on all the Baltic States and forms the Baltic Unitary State. In order to unite the Greater Baltics (aka reclaim Vilnius from Poland) under the Baltic Unitary State, significant luck is required. First, and most importantly, Poland must go down the "Poland First" branch of its focus tree, or else you will end up fighting an unwinnable war against the Allies. Next, Germany and the Soviet Union must not sign the Molotov-Ribbentrop Pact (this is not absolutely necessary, but will make it much easier to take Wilno without fighting the Soviet Union for it). Start by joining the Axis and aiding Germany during the invasion of Poland. When the peace conference occurs, claim Wilno and any neighboring states possible (states next to the Soviet Union are not recommended as they will only lengthen the border you must defend). After the peace conference, the player may take the decision "Move the Capital to Vilnius," moving the player's capital to its rightful location. From here, the player can prepare for the inevitable war with the Soviet Union, and, in the event of victory, turn on whoever controls Memel and the rest of Poland in order to unite the entire Baltic region under one banner.